I have always admired the Transcendentalist crowd of Concord, Massachusetts. Partly because I grew up in the Concord area. But, from an objective point of view, one has to concede that their writings comprise some of the greatest philosophy and poetry that the United States has ever produced. Some of them eccentric and hopelessly idealistic? Perhaps. Bronson Alcott was a little out there, I think. 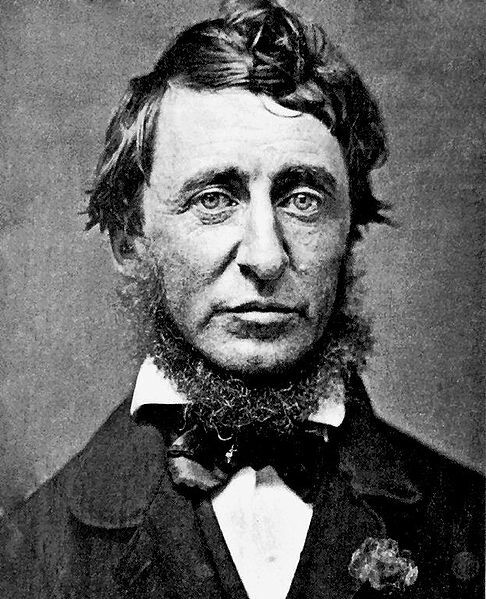 But I have always found much inspiration in the writings of Emerson and Thoreau. Living now in the Plymouth, I feel more distanced from that history and I sometimes miss Concord and its environs. Imagine my satisfaction when I learned that the unassuming, very 20th century neighborhood of Plymouth in which I reside has a connection to the Concord Transcendentalists. Benjamin Marston Watson was born in Plymouth in 1820. He attended Harvard College and there befriended Henry David Thoreau. Although the two did not initially become fast friends, they would eventually reconnect after their college days and would be quite close for many years. Immediately after college, in 1840, Watson became part of the Brook Farm Experiment, a short-lived effort on the part of several Transcendentalists to establish a Utopian community in West Roxbury, Massachusetts. There he met Nathaniel Hawthorne and Margaret Fuller, among other great thinkers and writers. Such experiments have a tendency to fall apart, however, and the members of the Brook Farm community, one by one, eventually drifted off and went their separate ways. Watson returned to his hometown of Plymouth in 1845. He returned quite changed by the ideals of Transcendentalism. A young man of 25, intelligent and Harvard educated, Marston Watson might have pursued a wide variety of worldly careers. But it was nature that intrigued him most. He envisioned his own little Garden of Eden among the low hills of Plymouth. It would be part arboretum, part experimental garden with rare specimens from all over world, and part commercial farm. Watson established his Old Colony Nurseries in 1845 on 80 acres of sloping meadow between three hills. In 1846, he had an elegant house built on the estate, designed in the Gothic style by his friend Samuel Longfellow (younger brother of poet Henry Wadsworth Longfellow). Watson called it “Hillside.” In the same year, he married his wife, Mary Russell. Although Watson already had connections with the Transcendentalists, it was his wife who strengthened the ties, making Hillside a special retreat for Concord’s philosophers. Mary Russell was best friends with another Plymouth girl named Lydia Jackson. It so happened that Ralph Waldo Emerson, during a speaking engagement in Plymouth, met and fell in love with Miss Jackson. They were married in Plymouth in 1835 and lived in Concord. Mary Russell frequently went to visit her best friend, now Lydia Emerson, in Concord. In fact, during one of these visits, she met Henry David Thoreau who apparently tried to woo her by composing a poem for her called, “To the Maiden in the East.” It didn’t work. She married Marston Watson instead. This strong connection to the Emersons through his wife enabled Watson to realize another ambition. He established a lecture series in 1852 to be held at Leyden Hall on Main Street in Plymouth. These lectures would feature the great names of the Concord circle. And, of course, during their time in Plymouth, many of them stayed with the Watsons at Hillside. Thus Watson forged strong friendships with Bronson Alcott, Thoreau and poet William Ellery Channing, among others. Apparently, Watson, Alcott and Thoreau were fond of walking the hills and trails for miles surrounding Hillside. As they walked, they freely discussed all manner of philosophy. A valued scholar, and, addition blest! Sounds like a great man and a proud legacy. Fast forward about 120 years to 1971. Hillside, at that time, was owned by Watson’s granddaughter, Christine Watson Bowler and her husband Robert B. Bowler. In that year the Bowlers donated a tremendous collection of Marston Watson’s papers to Pilgrim Hall Museum, preserving for posterity a rich record of the intellectual ties between Concord and Plymouth. In the same year, they developed hundreds of acres of land to the west of Watson’s Hillside, creating a variety of little neighborhoods with cul-de-sac streets named for Pilgrims. I live on one of these streets. I do like to think that this hill on which I live was one of those woodland spots that Thoreau, Alcott and Watson walked from time to time. Hillside is just a half mile from here and this is one of the more prominent hills in the area. I’m sure they covered it in their wanderings. Alas, Watson’s estate has seen some major changes. The hilltop upon which Thoreau felt he could burst into song is now covered by an apartment complex. Route 3, a major highway, roars past Hillside just 150 feet away from the house. There is some sad irony in the fact that a highway now bisects Watson’s own Garden of Eden. Trucks thunder literally a stone’s throw from what was an idyllic philosopher’s retreat. The house itself is still there, at least, although very few know about it or its significance. I only recently discovered it myself. I get the sense that it is biding its time. It will, perhaps, be more widely recognized by and by for the treasure it is.